A team that rarely hits homeruns just erupted for three, totaling six runs. First thought: This is good for the Clemson offense to find some runs without having to play small ball. This team has struggled to plate runners and get timely hits with runners in scoring position. Sometimes the cure is bring everyone in at once. Hopefully this creates some confidence, which could carry over to tomorrow. Second thought: Great for Wilkerson. He has been absolutely lost over the last week or so, but hopefully getting this offense jump started also jump starts his game. And it also seemed to affect his defense as he made some nice plays and great throws. While the Tiger's found some offensive success, they're still capable of more. So for, their offensive MVP and clean-up hitter is hitless. In fact, in the two game, three positions (C/LF/DH) have combined to account for a total of one hit. Jack has tried a few combos, but to no avail. If a couple of these guys (especially Boulware) can get hot, Clemson can make a run. But they will need at least one to get it going just to make it through Sunday. By no means did Daniel Gossett have his best stuff today, but he really worked hard and made pitches when needed, and ultimately limited Saint Louis to just two runs. A: I don't think he beats Liberty on Friday. The jams he got himself into were similar to what Erwin & Andrews got into, and it ultimately cost those guys. 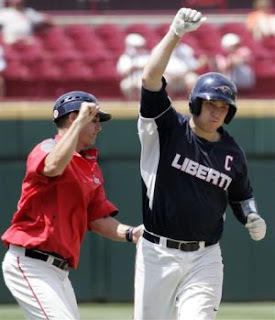 Liberty would have capitalized on a few of those and Clemson would have still lost, although it may have been closer. B: Being in the loss column with your ace having already taken the mound is a good feeling. Clemson was able to come out with some confidence knowing their main guy was backing them. Yesterday, Liberty looked like it belonged. Today, they looked like fodder for Spurrier's Florida teams. Everything that went right for them yesterday, went wrong today. Every swing that found a hole Friday missed entirely today. Literally, as Montgomery retired the side in the first two innings by strikeout. 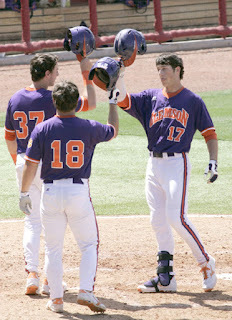 But credit to USC as they did something Clemson could not do Friday - get timely hits. Clemson had a chance to put a large number on the board in the first inning Friday, but reverted to the inept Clemson team we saw in Durham. South Carolina removed any doubt by dropping three in the first and four more in the third. Clemson has tasted winning for the first time since Thursday, May 16th, and it tastes good. But today's win does not guarantee a chance to face USC. It only offers them the chance to play tomorrow afternoon. USC still lurks in the evening shadows, and Clemson must dispatch a team that just manhandled them to play hide n seek with the Gamecocks. But just like today presented a new opportunity, so does tomorrow. 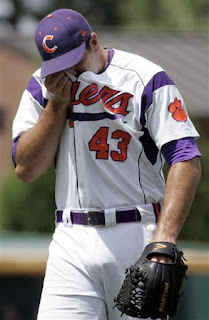 Clemson can prove Friday was a fluke. If they can do that, they will get a chance to do to USC what they have done to Clemson twice - advance over their rival from the loser's bracket. Someone will be working overtime on the Sabbath. The winner of the afternoon game gets a shot at undefeated South Carolina in the nightcap, and must defeat the Gamecocks twice to advance. If either team can force this regional to Monday, they will have put a full day's work in on a typical day of rest (but these guys are young - and if they lose, they have all summer to rest). While it's never easy to advance from the loser's bracket, Clemson does have one distinct advantage: quality arms, and a lot of them. Sitting rested in the bullpen are Crownover, Firth, Campbell, & Schmidt. Crownover will most likely get the afternoon start with Schmidt or Firth getting the call in game two. Also, with there being no tomorrow, Erwin & Andrews could potentially be brought back in specialty situations, or even be ready to start a Monday game, if needed. Yesterday, neither the ACC nor the SEC really represented as the 1st and 2nd strongest conferences, especially with losses to teams like Liberty, Bryant, Bill & Mary, & Austin Peay. *If I were Florida, I think I would have rather stayed home than go 0-2 against Austin Peay and Valpo. Tomorrow, four ACC schools and three SEC schools will try to lock up regionals, while the remainder of the schools try to stay alive. At the time of these thoughts, only one host school (Va Tech) has been relegated to the lower's bracket, and all host schools remain in the tournament. Additionally, 12 of the 16 schools eliminated have been 4 seeds, and no 1 or 2 seed has been eliminated. Here's to putting another late night edition together tomorrow night as Clemson prepares to play a winner-take-all affair on Monday.